La Peña Community Chorus has been singing songs of peace, justice, and hope since it began in 1978. 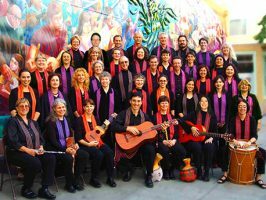 Started by the Chilean exile community who founded La Peña Cultural Center in Berkeley in 1975, the original mission of the Chorus was one of solidarity with the resistance against the dictatorship in Chile. But over the years our focus has expanded to other countries, including the struggles of people in El Salvador, Nicaragua, Mexico, Cuba, and to various labor, community, and women’s struggles closer to home. Our music includes not only the Nueva Canción (or “New Song Movement”) of Chile, but also styles based in the folk and social justice movements of all of Latin America. We sing in nursing homes, elders’ residences, hospitals, migrant labor camps, juvenile halls, rehabilitation centers, and schools, in addition to our public concerts and performances. In 1995, we were the first North American chorus to take part in the International Choral Festival in Santiago, Cuba. We followed that tour by visiting Chile in 1999, Mexico in 2002, Peru in 2006, Uruguay and Argentina in 2011, and Cuba again in 2017.